Navratri is the Indian festival celebrated for the worship of the Hindu deity Durga. Navaratri means Nine nights, nav here nine and Ratri means nights. During these nine nights, nine different forms of Durga Maa is worshiped. Navratri is the celebration for the worship of Goddess Amba. The whole India celebrate Navratri and worship Shri Durga Maa with their own style. Durga Chalisa is a forty verse prayer dedicated to Goddess Durga, describing her beauty, strength, and courage. 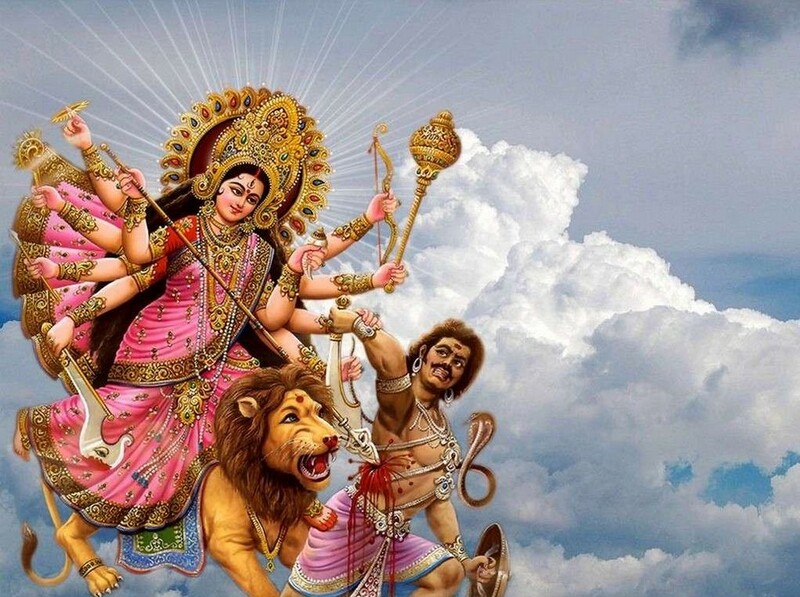 Include Durga Chalisa Lyrical full HD Video in your Pooja on this Navaratri and also Read Durga Chalisa Lyrics in Hindi & Shri Durga Maa Chalisa Lyrics in English. I Salute You, O Mother Durga, You Bestow Happiness to all. I Salute You, O Mother Amba, You End all Miseries. (I Salute You, O Mother Durga), Your Radiance is Limitless. And You Illumine all the Three Worlds (Earth, Heaven And the Nether World). (I Salute You, O Mother Durga) Your Forehead is Shining like the Moon and your Face is Very Big. And Your Eyes are Red with a Frightening Frown. The very Sight of Which gives Joy to All. (I Salute You, O Mother Durga) In You lie all the Powers of the World. And You Nurture the World with Food and Wealth. (I Salute You, O Mother Durga) You as Mother Annapoorna Nurture the whole World. And You are the Primordial Sundari Bala (form of a young girl of extreme beauty). (I Salute You, O Mother Durga), You Destroy Everything at the time of Pralaya (the great Dissolution). You are Mother Gouri, the Beloved Consort of Lord Shankara. (I Salute You, O Mother Durga) Your Praises are Sung by Lord Shiva and the Yogis. And on You Brahma and Vishnu always Meditate. And Grant Wisdom to the Sages and thus ensure their Welfare. And Appeared Breaking the Pillar (to save Prahlada). And You are the Ocean of Compassion; Please Fulfill my Wishes. Your Glories are Limitless and cannot be Described. (I Salute You, O Mother Durga) You are Matangi and Dhoomavati Mata. And You as Mother Bhuvaneshwari and Mother Bagalamukhi Bestow Happiness to all. (I Salute You, O Mother Durga) You are Mother Bhairavi and Tara Devi, the Redeemer of the World. And You as Mother Chhinnamasta, Remove the Sorrows of the World. is welcome by the Brave Hanuman Moving Forward. (I Salute You, O Mother Durga) You Repose in Nagarkot (Kangra). And make the Three Worlds Shudder with the Might of Your Glory. And Filled the Earth with the Weight of his Many Sins. And Killed Him (Mahishasura) Along With his Army. Remain Sorrowless because of Your Grace. (I Salute You, O Mother Durga) Your Light resides in Jwalamukhi. All Men and Women Always Worship You. Sorrow and Poverty will Not Come Near him..
Will be Freed from the cycles of Birth and Death. Without your Power there cannot be Yoga (union with the Divine). And Never Thought of You. When his Powers Waned, he started Repenting. Victory, Victory, Victory to Mother Bhavani, the Mother of the Universe. And She Gave back his Powers Without Delay. Apart from You, Who can Remove my Sorrows? And Passions and Lust Torment me. I Meditate on You with One-Pointed Devotion. (I Salute You, O Mother Durga) Bestow Your Grace on me, O Kind Mother. And Give me (Spiritual) Wealth and Power. And let me Always Sing Your Glories to Others. Will get Worldly Prosperity and finally Attain the Supreme Feet of the Mother. Please Bestow your Grace, O Mother Jagadamba Bhavani. May this Navratri brings the Happiness, Prosperity, Joy and Success in your life. Daily listen Shri Durga Chalisa in Hindi Audio at the time of Devi Durga Puja.